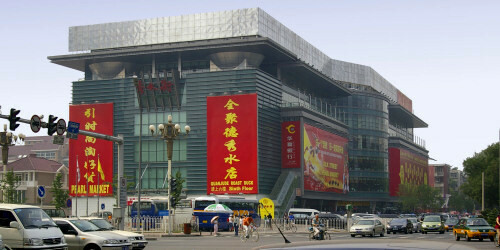 Just like HongQiao Pearl Market offers more than pearls, Silk Market offers a lot more than just silk. In the basement floor you'll find shoes, belts, handbags and suitcases etc. On the first and second floors there are mainly designer clothes. Be careful to try on everything you buy here, to be sure you get the right size. Silk products are sold on the third floor: ties, tablecloths, traditional clothes as well as dressing gowns, underwear and many other products made of silk, and children's wear. There are also tailors here, willing to make suits or dresses for tourists that often pay a little more than they should. Floors four and five have jewellery, pearls, Chinese crafts and art, watches, electronics etc. Having walked all the way up here, you'll probably be quite tired of all the yelling salespeople pulling at you. In that case, continue to one of the restaurants on floors five and six, where you can sit down and eat something. Since there are a great number of foreign tourists on this market, salespeople here are pretty good at speaking English. Moreover, they often know a few selling phrases in a number of other languages, like Spanish, Italian, German, French and Swedish. The salespeople are extremely pushy and the prices they suggest are high, so bargain a lot.